What expectations do you have of the first scene of a play? In light of expectations evaluate the success of the introductory scene of 'The Duchess of Malfi'. What expectations do you have of the first scene of a play? 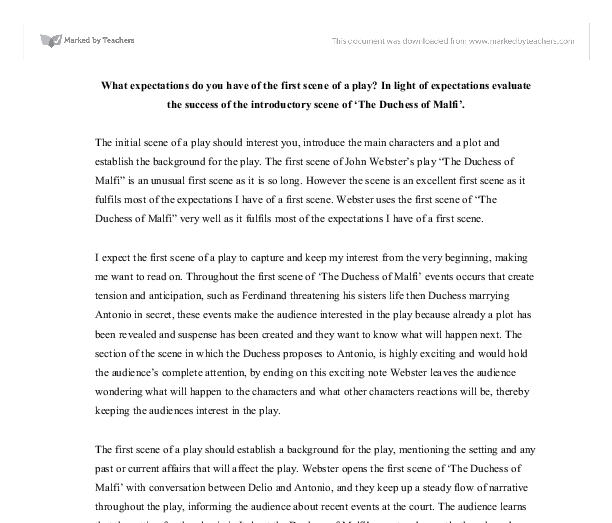 In light of expectations evaluate the success of the introductory scene of 'The Duchess of Malfi'. The initial scene of a play should interest you, introduce the main characters and a plot and establish the background for the play. The first scene of John Webster's play "The Duchess of Malfi" is an unusual first scene as it is so long. However the scene is an excellent first scene as it fulfils most of the expectations I have of a first scene. Webster uses the first scene of "The Duchess of Malfi" very well as it fulfils most of the expectations I have of a first scene. I expect the first scene of a play to capture and keep my interest from the very beginning, making me want to read on. Throughout the first scene of 'The Duchess of Malfi' events occurs that create tension and anticipation, such as Ferdinand threatening his sisters life then Duchess marrying Antonio in secret, these events make the audience interested in the play because already a plot has been revealed and suspense has been created and they want to know what will happen next. The section of the scene in which the Duchess proposes to Antonio, is highly exciting and would hold the audience's complete attention, by ending on this exciting note Webster leaves the audience wondering what will happen to the characters and what other characters reactions will be, thereby keeping the audiences interest in the play. ...read more. Antonio tells the Delio about the Duchess and her brothers as well as about Bosola, the audience via this learns about the characters and their past, although Antonio's view of the characters may be biased the audience can learn much about Antonio himself through his discussion of other characters. "I knew this fellow seven years in the galleys For a notorious murder, and 'twas thought The Cardinal suborned it" A simple speech like this not only reveals not only Bosola background but also inform the audience of views of the Cardinal, conversation between Antonio and Delio is used by Webster in this scene to communicate to the audience details about the characters background and personality. For the audience to have a full interest in the play it is vital that the writer establishes the characters early on so the audience can follow their progress and so they can understand the characters actions. Fort example in the first scene of 'The Duchess of Malfi' through Antonio's description of Ferdinand, the Prince's dealings with Bosola and things he says when in conversation with the Duchess the audience starts to believe that Ferdinand is crazy and has an obsession with his sister, a reasoning that will later help the audience to understand Ferdinand's actions. A play should be given direction in the first scene; the writer should have revealed the basis of the plot, so the audience is left in suspense as to what will happen next. ...read more. It is also important for the audience to realize what kind of relationship the Duchess has with her brothers, the Duchess at the very beginning obviously trusts her brother, Ferdinand as when he asks her to give Bosola a position in her household she agrees immediately without question, even later after Ferdinand has threatened her life the Duchess still does not suspect Bosola giving him vital information that will kill her and her children. This shows that the Duchess has a naive and trusting relationship with her brothers, at least on her part. This can also be seen in the way the Duchess does not believe her brothers will carry through their threat if she does marry, "Yet, should they know it, time will easily Scatter the tempest" The Duchess's brothers on the other hand view the Duchess as a means to their own ends, especially the Cardinal and caring more about their family honour than the Duchess herself. These relationships will become important as the play progresses so it is important that the audience knows them now. Overall the first scene of John Webster's play 'The Duchess of Malfi' fulfils my expectations of the opening scene of a play. 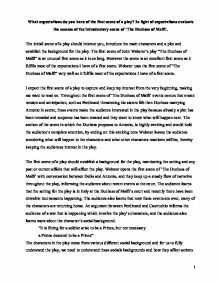 The initial scene of a play should interest you, introduce the main characters and a plot and establish the background for the play, as well as other things, while not giving away too much of the play and still keeping the audiences interest. Webster uses the first scene of 'The Duchess of Malfi' to do this very well. 1 ...read more. As the characters start to get excited about the squirrel on 'Have ya? Honest?' the pace picks up again. As they progress through the scene it gradually gets higher and at the end - 'I got', 'See' - they all are run off at full speed. he answers Levene in short sentences and I think Williamson is almost condescending towards Levene. The flashback also shows what Judy was like as a child, how she was a bully and not very clever at school, this could show how her childhood has affected Judy as an adult. Cross cutting is used throughout the play. The fourth frame shows a boy smashing a car window and stealing from the car, his picture also appears into the corner of the screen. The fifth frame is a cell door closing and someone locking it, once again a picture of a child fades into the corner. Horatio goes on to explain the production of weapons and why Denmark is on a war footing, beginning: "That can I- At least the whisper goes so." This further exaggerates the message that something secret, something that not many people should be aware of is occurring; as Horatio describes what he knows as "the whisper".